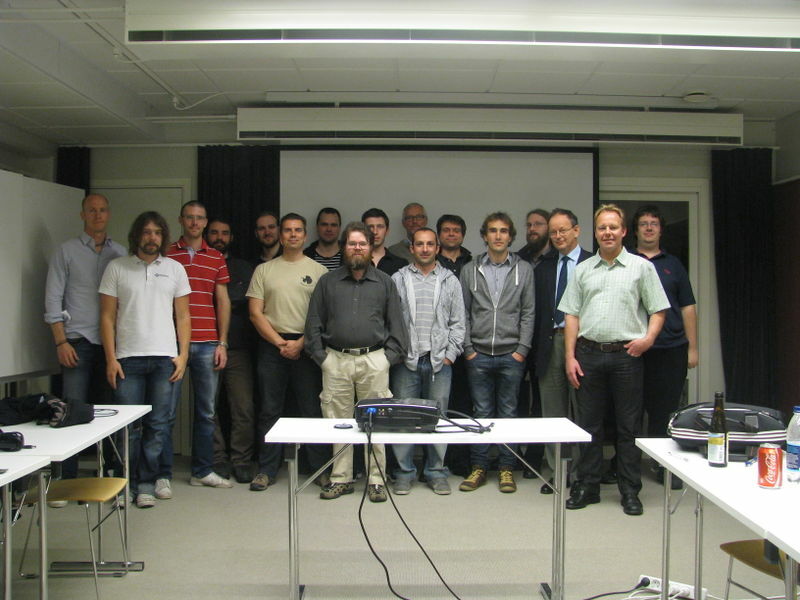 The first OpenRISC project conference - ORCONF 2012. This is a conference which aims to bring together those involved with open source embedded systems development, from the transistor level up to Linux userspace and beyond. It is intended that the meeting would be useful for both developers and users of the platform to attend. The event will run over Saturday, October 13 and Sunday, October 14. The venue will be open from 11:00 on Saturday, with a light lunch available from 11:30 and presentations starting at 12:00. Some drinks and snacks will be provided at the venue by the sponsors on the day. It is planned that the event will be run over Saturday and Sunday, with the bulk of the presentations on the Saturday. The day will formally begin at about midday, with a light lunch being provided from 11:30AM to encourage people to come along a little early. There will be a brief welcome and introduction of the sponsors before we begin presentations. Below is the running order of the day, estimated durations and times sessions are expected to start. There is slack in the schedule to allow for questions following presentations, and breaks. For those that like their nostalgia in large doses can find a YouTube playlist of all videos. Proposed dates are lunchtime Saturday 13 October through afternoon Sunday 14 October. This will allow people to fly in on the Saturday morning and out on the Sunday evening. English menu for the restaurant here. The following are proposals for presentations or discussions for the meeting. A presentation of the new OR1k CPU implementation, demo it running and give an idea of its features, its implementation/verification approach, and its synthesis characteristics. I would invite Stefan Kristiansson to talk about about his portion of the design. A discussion session to go over the proposed OR1K architecture amendments as detailed on the OR1K wiki Architecture_Specification#Proposed_changes. A presentation/discussion session to go over the progress on the OR2K project. The OpenRISC project has grown to the stage where it needs better project management processes. Up until recently there was generally only one active developer for each component, who could be left to do their own thing. Now we have to co-ordinate multiple developers, with different agendas and different views on how processes should be managed. Process for review, approval and commit of changes. How do we choose lead developers/maintainers/approvers? When should we start a new version, and how? Structure of the project. Should ORPSoC be a separate project to OpenRISC (like minsoc)? Should the tools be a separate project as well? Should we have a project manager and if so how should he/she be chosen? Choice of version control system. Do we leave it to the lead developer to choose/change or do we establish a project-wide policy. Where should repositories live. Should they always be on OpenCores.org or always on openrisc.net or on the lead developer's GitHub/SorceForge account? Mailing lists and IRC. In addition to the OpenCores forum, we have two OpenRISC mailing lists, one run by opencores.org, one by openrisc.net. Last year's meeting achieved a concensus that for the time being all contributions would be cross-posted, pending the merging of the two lists (which was agreed to by both list owners). The lists have not been merged and the concensus is now breaking down, making entry for new participants very difficult. We also have two IRC channels on Freenode (#opencores and #openrisc) which both discuss the same subjects, but with a not completely overlapping set of contributors. How do we move forward? When I look at the list above, it is clear that the questions are being asked in a vacuum. So I think we need an initial discussion on the question of "What is the primary purpose of OpenCores and OpenRISC?" These are difficult issues, but we cannot miss the opportunity to discuss them. It will be important to keep the discussion structured (hence my list above) and well chaired (to ensure all points of view are heard). Where concensus is reached, that can be used as an agreed process going forward. However the whole discussion should be documented, so where there is not agreement, we have a starting point for the future. A number of contributors have been working on a port of LLVM for OpenRISC. This is an update on progress. Experimental support for dynamic linking is being added to the Linux toolchain. This is an update on progress. A number of problems has been identified with the current version of ORPSoC. ORPSoCv3 aims to fix this by having a more modular structure, reducing complexity for common operations and taking better advantage of the other components in the OpenRISC ecosystem. Sven-Åke Andersson will do a presentation talking about his OpenRISC introduction blog series he recently did on rte.se. The eCos port for OpenRISC has recently had a makeover, and will be presented. The session will consist of explanations of the OS, how it works, details of the OpenRISC port and a demonstration of the software running on OpenRISC hardware. ORConf is organized by the FOSSi Foundation's conference commitee. This page was generated by GitHub Pages. Tactile theme by Jason Long. Logo design by ei8htz.